For Geocachers: there is a cache around here; the hint is “Dulcis in Fundo” (there we are, at last) - the cache is small and magnetic. Whisk the eggs, yolk, sugar and a pinch of salt until the mix is fluffy. Add the flour and whisk. Put the mixture in a piping bag and create some 7/8 by 1 cm sticks on a baking dish. Be careful to keep them apart. Cover the baking dish with some baking paper, set aside for 15/20 min. Preheat the oven to 180°C. Cook the biscuits for 15/20 minutes until golden. Remove them from the baking dish and let them cool. 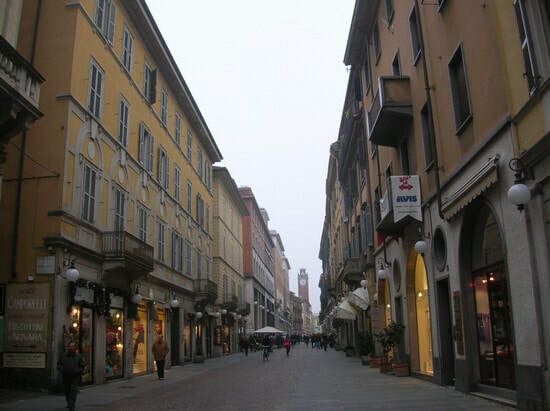 Along corso Cavour, nearly halfway between the Angolo delle Ore and Piazza Cavour, on your left, you will find Vicolo Monte Ariolo, where the famous Camporelli shop is located. 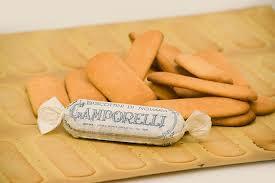 Camporelli is a biscuit shop and factory that was founded in 1852. It produces the Novara biscuits (biscottini di Novara), which are lightweight cookies with an airy and crumbly texture, a rectangular shape with rounded corners and a golden color. The only three ingredients used to prepare these delicious cookies are: wheat flour, sugar and eggs (no butter or other fats! ); for this reason the biscuits are extremely light and easy to digest. 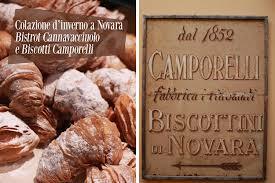 In the 16th century in some female convents around Novara the nuns used to make biscuits to be offered to the pilgrims. Those biscuits were made according to a recipe that was handed down for generations. With the suppression of the convents, ordered by Napoleon Bonaparte in 1800, the nuns were expelled and had to change their lives. Some of them were given hospitality by the wealthy families of the city and there they started sharing their knowledge and skills, also related to culinary art. Some pastry and biscuit factories made the biscuits famous and developed preservation methods to distribute the biscuit also out of the city. The most famous version of the Biscottini di Novara nowadays, which are sold all over the world, are the Pavesini. and distributed in stores mainly in the North of Italy. Something curious: at the corner between Corso Cavour and Via Monte Ariolo there is a shop that is quite peculiar: it’s Adriano Stefanelli’s Shoe Shop. Stefanelli has made shoes for very important personalities including the Pope Benedetto XVI, George Bush, Michelle Obama, formula one pilots and famous Italian politicians.